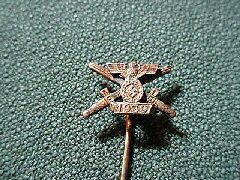 DESCRIPTION: This is the Spange (clasp) that could be worn stickpin style showing that the wearer had won the WW I Iron Cross and then won it again in WW II. Why the swords??? 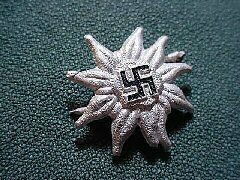 DESCRIPTION: This is the one in gold for 40 years' service to the German Reichs. 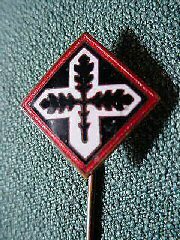 DESCRIPTION: This is the stickpin used by the Army Veterans' League. 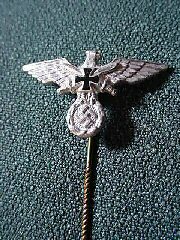 A beautiful silvered eagle and Iron Cross with "Ges Gesch" on the back. 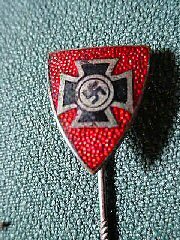 DESCRIPTION: This was the membership stickpin as worn by those who served in WW I. The Kyfhauser Monument is depicted. Marked "Ges Gesch." 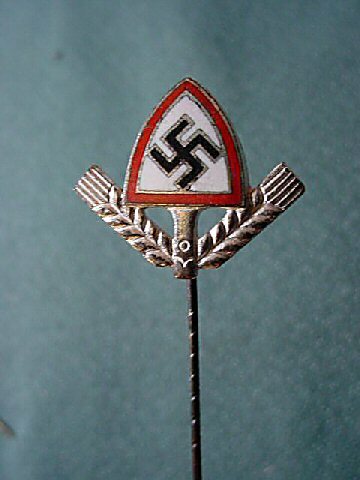 DESCRIPTION: This is a very beautiful stickpin as worn while in civilian clothing by members of the Reich Labor Service. Highly enameled in two distinct colors. The wearer of this one could be very proud of this fine piece of jewelry. 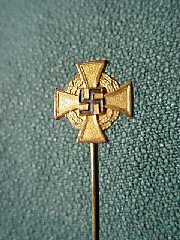 DESCRIPTION: This is a rare stickpin for actual employees of the army, navy, and Waffen-SS (bronze). 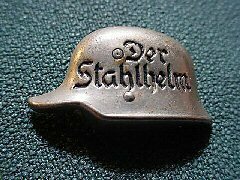 DESCRIPTION: This is a unique helmet pin of the Stalhelm, the militant ex-veterans' organization that fought alongside of the Freikorps to put down the Sparticists and other Red Front organizations in the turbulent 1920's. Marked at the underneath portion of the helmet N&H "Ges Gesch." Not really a stickpin. More a short pin or lapel pin. 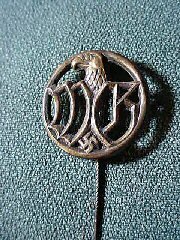 DESCRIPTION: This is a small pin that would be worn attached to the Lederhosen outfits of those tough mountain men from the small towns of the Bavarian Alps. These fellows were the toughest of the SA formations that fought the communists in the early street battles around Munich. Very rare! DESCRIPTION: This is unusual as most party pins were with the horizontal pin back, but this member preferred to have his as a stickpin. 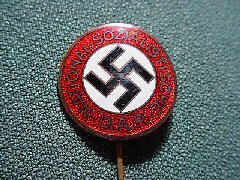 Nicely enameled with the words (translated) "National Socialist German Workers' Party" around the rim. DESCRIPTION: This was the Nazi-created veterans' organization. 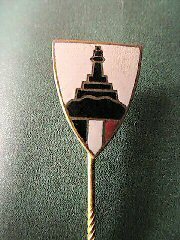 This is a membership stickpin for the organization. Nice enameled pin. "Ges Gesch" on the back. DESCRIPTION: This was one of the Nazi-approved church groups that taught the Luther ideals; "A Mighty Fortress is Our God." This was for the youngsters' group that eventually went over to the Hitler Youth. Nice enameling.